There are days when I crave for healthy vegetarian food. One such day, this simple recipe came to my rescue. I had fresh vegetables, and the recipe seemed easy enough to be made at the end of a very tiring day. To make aromatic vegetables on a bed of rice, the vegetables were cooked in the sauce of two aromatic herbs, Lemon Grass and Star Anise. The end result was an extremely fulfilling and satisfying dinner. You can use Broccoli instead of Cauliflower, or use both. Add some beans, and a few more vegetables, whatever suits your fancy, actually. I used what I could find in my own fridge. Whatever you use, this recipe will turn out to be delicious. Cook the rice with some salt, and keep aside. Peel and cut carrots. wash lemon grass stalk. Separate cauliflower into small florets and boil them in salt water for about 1 min. Keep aside. Cut cabbage into half cm. Trim spinach leaves. 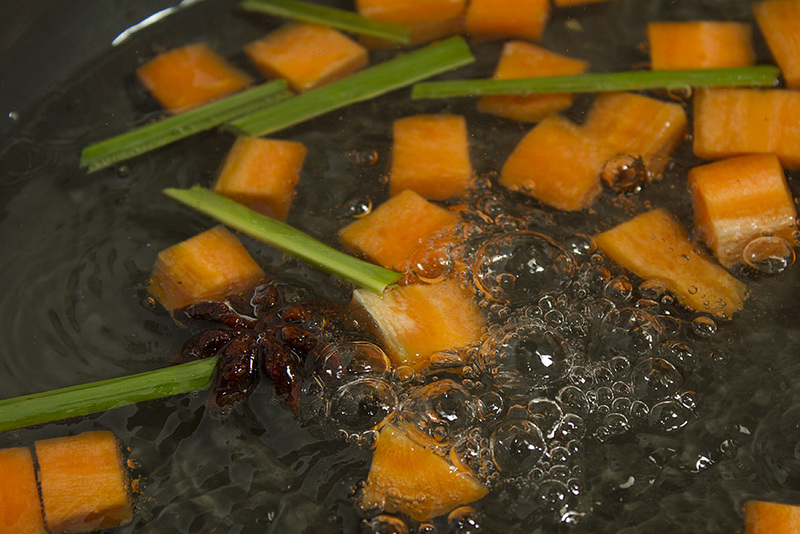 Take three cups of water in a pan, add lemon grass, star anise and carrots and bring it to a boil. 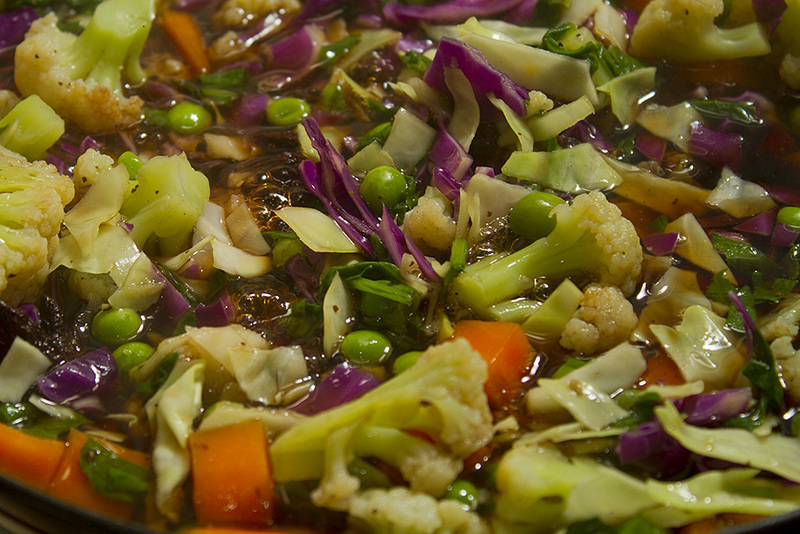 continue to cook in boiling water for three minutes, reduce heat and add green peas and cauliflower florets. Simmer till green peas and carrots are just done. Stir in cabbage and spinach leaves. Season with salt and crushed pepper corn. Add soya Sauce, bring it to a boil. Dissolve corn flour in half cup water and stir it in. Simmer for half a minute. Pour the cooked vegetable and aromatic sauce on the rice prepared earlier. This one dish meal is best-eaten immediately after prepration. 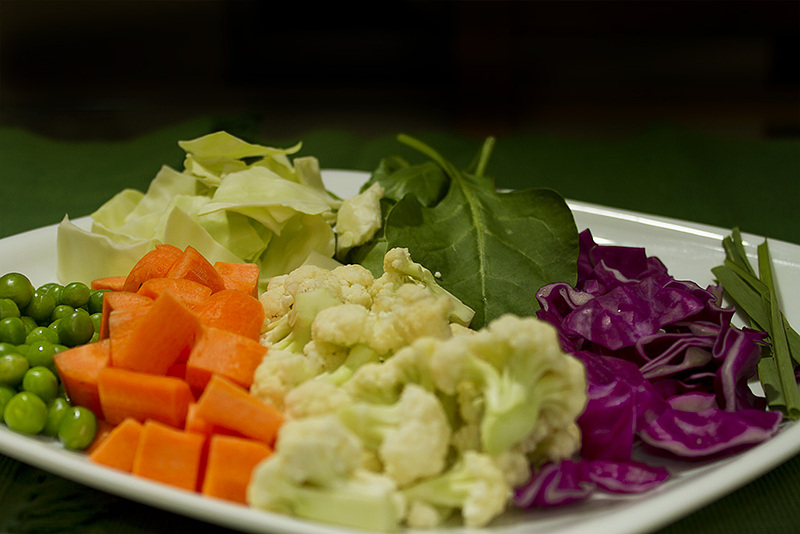 Some interesting information about the herbs used for cooking Aromatic Vegetables. The Aromatic Vegetables on Rice recipe uses Lemongrass and Star Anise..
Peas, Carrots, Cauliflower florets, Red and Green Cabbage, Spinach and Lemon Grass.